God sent the plague of locusts to persuade the pharaoh to release Moses and his people from slavery in ancient Egypt. Even His people can’t have welcomed their arrival, as they would have been the first to lose their rations in any ensuing famine. But it was a price worth paying as the locusts, along with a series of other nastiness, got them out of slavery. If only Pharaoh had been more reasonable it would never have been necessary. Pharaoh brought the locusts onto himself, his country, and his victims. The plague of claims management companies has been brought on by the actions of the banks and the inactions of the courts and regulators. PROBABILITY OF SUCCESS NEGLIGIBLE, so long as excessive pay tempts in bankers who need excessive profits to pay for their excessive pay. 2nd Best Choice: When caught in a rip-off the banks should find the people they ripped-off and compensate them. Banks know who they are because they have been taking money from their accounts every month for years. PROBABILITY OF SUCCESS NEGLIGIBLE: see previous point. 3rd Best Choice: FSA forces the banks to find the people ripped off and compensate them. PROBABILITY OF SUCCESS NEGLIGIBLE: with its “light touch approach” the FSA has traditionally seen us Britons as the rightful prey of financial companies. The FSA's "light touch" is the touch of stunning tongs applied to a lamb's head before slaughter. Not much sign that its successor the FCA will be any different. PROBABILITY OF SUCCESS HIGH. They will work their little locust mandibles off, because they can swallow a large chunk of the proceeds. The alternative to this plague of claims management companies would be the banks getting away with almost all of their ill gotten gains. The banks, represented by the British Bankers Association, fought hard in the courts to avoid having to compensate victims who did not complain. Knowing that most Britons would find the complaints process too cumbersome and would either not complain at all or give up at the first hurdle of rejection of the complaint by the bank (customers who didn't give up and actually went on to appeal against the bank's rejection overwhelmingly won their cases in front of the Financial Ombudsman). According to the Financial Ombudsman, by October 2012 just one in ten people sold PPI had complained. An illustration of how financial companies felt secure in not having to repay ripped-off monies can be seen in how the banks have drastically increased the money put aside for compensation. Lloyds optimistically set aside £3.2 billion in May 2011, but had to add a further £2 billion by November 2012. Who can doubt that claims management companies played a part? 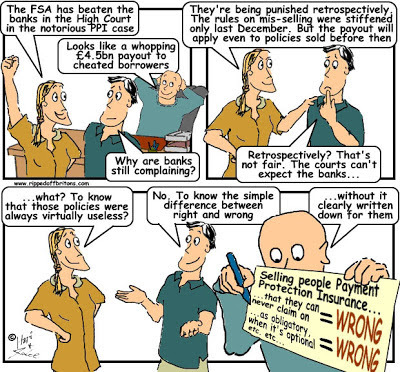 Another example of getting away with the proceeds of ripping-off the 'uncomplaining Briton' came in November 2012 when the FSA imposed its largest retail fine on a company for selling protection against credit card fraud and identity theft. The FSA accepted the culprit’s estimate that just £14.5 million would need to be paid in compensation out of total sales of £844.8 million. Details of this scam in the FSA's report expose a litany of sales-scripted fibbing that would make few sales untainted. And yet less than 2p in the pound has been budgeted for compensation! How long before the locusts scent a meal here too? 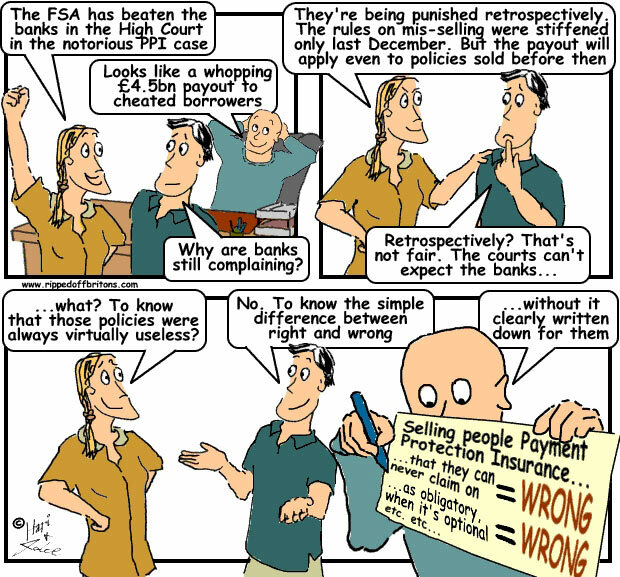 Did the banks know PPI was a rip-off? According to the Competition Commission report banks were seeing fantastic profits from PPI. A return on equity (RoE) of 490 percent, compared to a normally healthy RoE of upto 20%. We calculated that the 12 largest distributors made profits after tax in excess of the cost of capital on PPI of £1.4 billion in 2006 [alone], representing a return on equity (RoE) of 490 per cent. A 490% rate of return is only otherwise seen in back-street muggings, where the cost of cleaning bloodstains off your hoodie is a small fraction of the cash in your victim’s purse. Had the banks kept the ripped-off PPI profits, that would have further encouraged them to continue perpetrating rip-offs. Banks will not voluntarily hand back their ill-gotten gains, even when they know who and where the victims are. Jailing a drunk driver will not restore the health of his victims, but it may dissuade him from drink-driving again. Using a claims management company may not get you back all your money, but it may dissuade banks from trying a similar scam again. Better for banks not to rip us off. Better for victims to make their claims by themselves. But failing that, better for the locust claim managers to take a chunky commission and the victims to get the rest, than for the finance industry to simply pocket the cash with renewed confidence that they can dream up and get away with the profits of other scams. "Lloyds has admitted shortcomings in the handling of complaints at a centre set up to deal with PPI mis-selling. It comes as an undercover reporter at the Times said staff at one of the bank's complaints handling centres had been taught to "play the system". The reporter said he was told to ignore possible fraud by Lloyds salesmen and that most complainants would give up if rejected the first time."